Reproduction 1950s, 1960s, 1970s old light switch plates and antique outlet covers that have been discontinued by the original manufacturer but are custom-made by Kyle Switch Plates. Find discontinued, vintage, or midcentury wall plate covers for button switches, Sierra electric biplex receptacles, triplex outlets, small rocker switches, or narrow toggle dimmers. Also shop specialized Low Voltage Switch Plates or Push Button Light Switch Covers. Nutone Intercom Electrical Wall Plate Cover 7.5", Screws 4.5"
Looking for old light switch plate covers for a vintage lighting system but don't see what you need above? 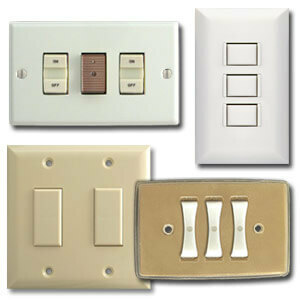 You may be searching for low voltage light switch plates or push button wall plates. Low voltage lighting systems use relays to step down the line voltage to a safer and more economically level. The switches and wallplates are odd-looking and are often stacked with multiple square or rectangular buttons on the same cover. If you don't know if you have a low voltage system or what brand it is, we recommend checking out How to Determine Your Low Voltage Lighting System. There are many versions and a large selection of replacements, so be sure to review the photos to see if one of those match the look of the wall plates in your installation. Another distinct antique lighting system is one installed in old turn-of-the-century homes. Push-button switch plates feature two round knobs that protrude about 1/2" from the light cover. Fun to use, reproduction push buttons are enjoying a resurgence in popularity for retaining their uniqueness while adding modern conveniences like light dimmers or 4-way switches. If you are interested in adding vintage charm to an older home, pushbutton light switches are an excellent choice because they require no special wiring and are easy to install.